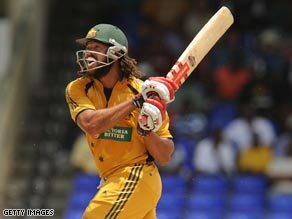 (CNN) -- All-rounder Andrew Symonds has been left out of Australia's cricket squad for this summer's Ashes series in England -- as selectors decided to reward the players who performed so well in the recent series in South Africa. Symonds missed out on an Ashes squad place as selectors kept faith with the players who won in South Africa. Symonds has been a controversial character, both on and off the pitch, in recent seasons and was left out of the winning squad that toured South Africa in order to undergo councelling for a number of personal issues. There were few other surprises in the squad, which features just five players who took part in Australia's Ashes whitewash over England in the summer of 2006-07. As expected, veterans Stuart Clark and Brett Lee come back after injury. Shane Watson won the nod for the all-rounder's berth despite being under an injury cloud and not bowling since last December. However, selectors expect him to be fully fit for the start of the Ashes and the ICC World Twenty20. Spinner Nathan Hauritz was preferred ahead of Victoria's Bryce McGain after performing well in recent one-dayers in South Africa and the UAE. In keeping with tradition, selectors chose a back-up wicketkeeper, naming South Australian Graham Manou as Brad Haddin's understudy. National selection panel Andrew Hilditch said the squad contained a blend of experience and youth. It contains only four players who have played a Test in England and 11 first-time Ashes tourists. "The core of the squad is made up of the side which successfully won the Test series in South Africa and includes Phillip Hughes and Marcus North who both scored hundreds on debut," Hilditch told Press Association Sport. "We expect the Ashes to be an exciting and riveting encounter, consistent with the great tradition of rivalry between England and Australia. Captain Ricky Ponting was quick to dismiss any suggestions he is disappointed that Symonds missed out, preferring to focus his attention on the players who have been chosen in his place. "The selectors have got a tough job picking any team, it's obviously very hard picking an Ashes squad and unfortunately for Andrew this time there hasn't been room in that 16-man for him," Ponting told reporters. "He made a reasonable comeback in the one-day team in Abu Dhabi and Dubai and unfortunately missed out on this selection. But I know he'll keep working hard and he'll give himself every opportunity to make his way back into the team in future. The first Test starts in Cardiff on July 8. Australia's Ashes squad: Ricky Ponting (c), Michael Clarke (vc), Stuart Clark, Brad Haddin, Nathan Hauritz, Ben Hilfenhaus, Phillip Hughes, Michael Hussey, Mitchell Johnson, Simon Katich, Brett Lee, Graham Manou, Andrew McDonald, Marcus North, Peter Siddle, Shane Watson. Meanwhile, England batsman Kevin Pietersen will miss the one-day series against West Indies through injury but is expected to be fit for the Ashes series. The 28-year-old will sit out three matches, starting at Headingley, Leeds, on Thursday, with an Achilles injury, which the team's medical staff described as a precautionary measure.